With so many Mars novels having been published in recent years, including award-winning fiction by Kim Stanley Robinson and others, it's hard to believe that even a talented writer like Benford (Cosm) could pull off another successful retelling of humanity's first expedition to the Red Planet--but he does. In the early 21st century, after NASA's Mars program has been grounded because of a Challenger-like catastrophe, a $30 billion prize is announced to be awarded to the first private organization that can land a spaceship on Mars, do serious science and return in one piece. Enter John Axelrod, eccentric billionaire and space aficionado. His Consortium launches a bare-bones Mars expedition that is closely followed by a Chinese-European attempt, and the race for Mars is on. Landing on the Red Planet, veteran astronaut Julia Barth and her comrades run into difficulties. Their return craft has suffered serious damage and may not be repairable. Even if they can lift off, they discover that their nuclear-powered Chinese-European competitor, although launching later than they did, may have the sheer power necessary to return to Earth first. Then, after months of fruitless searching, Julia discovers evidence of life on Mars. Benford is a solid prose stylist who creates full-toned characters. A practicing physicist, he writes plausible hard SF as well as anyone on the planet, and his portrait of Mars is among the most believable in recent genre literature. His strange and beautiful Martian ecology is so well described, in fact, that most readers will hope to explore it further, in a sequel. 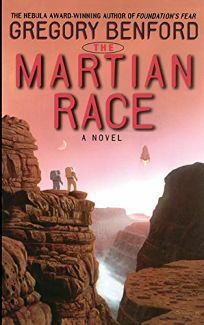 (Dec.) FYI: The publication of The Martian Race will coincide--hopefully--with the scheduled December 3, 1999, touchdown of the Mars Polar Lander.